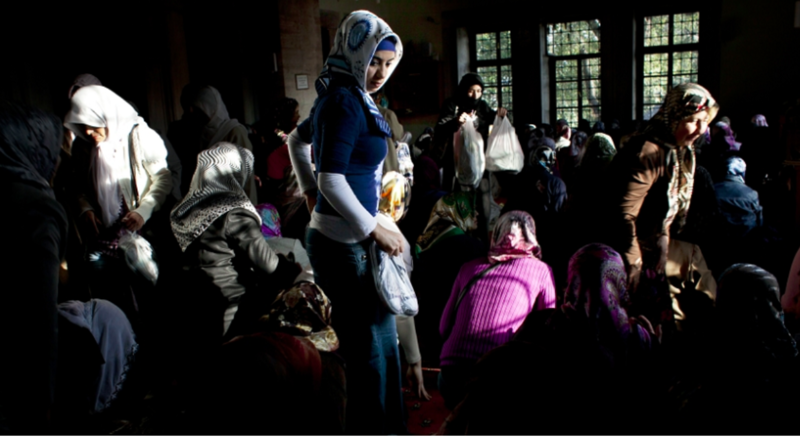 ISTANBUL — There’s not a lot of female energy in the Directorate of the Istanbul Mufti. This large, blocky Ottoman-era building houses the state bureaucratic entity in charge of every aspect of Islam here, from hiring imams and writing their weekly sermons to paying their salaries and approving designs for new mosques.Much of what female energy there is comes from the small, tidy office of Kadriye Avci Erdemli, who three years ago became the first female deputy mufti of Istanbul and one of Turkey’s highest-ranking female religious officials. “I want to change this situation,” says a calm and level-headed Erdemli, 47, her smile as easy as her project is ambitious. 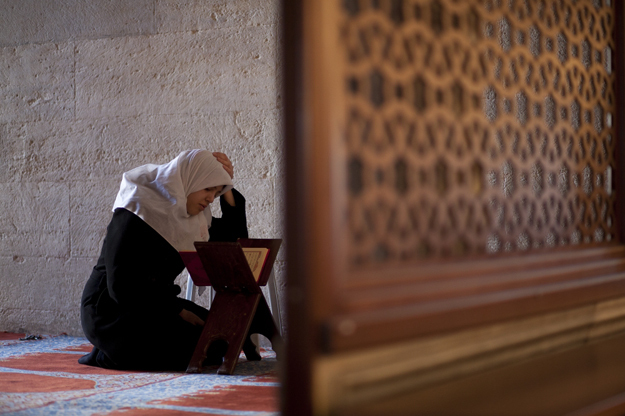 “Beautifying the Mosques of Istanbul for Women” is trying to change centuries of Turkish women’s praying habits by bringing them out of the home and into the mosque. Erdemli says it’s perhaps the biggest and most organized project of its kind in the world. While no one is suggesting an end to the practice of gender segregation during prayers, Erdemli says women are entitled to the same spiritual enrichment as men — and in the same mosques. 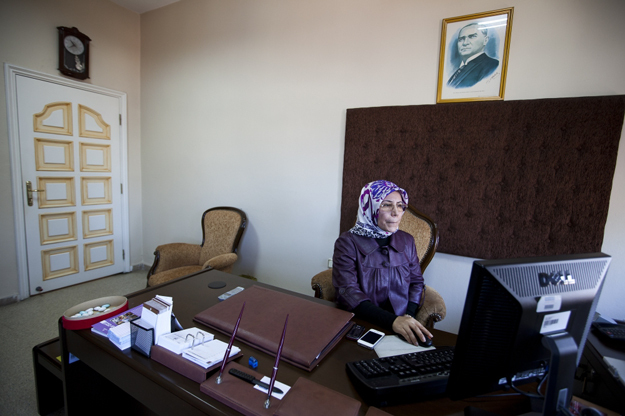 Looking down sternly on her desk from the wall above, as he does in every state office in Turkey, is an old, framed portrait of Mustafa Kemal Ataturk, the fiercely secular founder of the modern Turkish republic.Ataturk distrusted religion in his guts. Trying to build a modern, westward-looking state from the ruins of the Ottoman Empire — the last Caliphate, or Muslim ruler claiming descent from the prophet Muhammad — he made sure that every aspect of religion was kept under tight government control, where it has stayed. But despite the Kemalists’ best efforts, the electoral victory by the Islamic Justice and Development Party (AKP) in 2002 has allowed pious Turks like Erdemli to lead a slow-motion Islamic revolution in Turkish society. For the first time since the republic was founded, in 1923, public expressions of religiosity are socially acceptable in Turkey. The AKP has promoted a moderate brand of Islam from within Turkey’s deeply secular state and encouraged the growth of a new Muslim middle-class. Erdemli’s project is an expression of this new political will to use the state to promote Islam in daily life.Turkey is undertaking this unusual project because it’s more economically developed than other Muslim countries and women are more aware of their rights, Erdemli says. For Sebnem Gumuscu, a political scientist at Sabanci University in Istanbul, the program is a small part of the larger ambitions of Diyanet, the state institution responsible for religious affairs, including all the muftis in Turkey.“Diyanet has always had its monopoly in the mosques,” Gumuscu says, noting that it has been expanding its reach in recent years into areas such as proselytizing in the streets and establishing itself within public education. “Now it’s becoming an integral part of social life,” she says, reflecting the government’s preference to use religion to address all sorts of social problems, including domestic violence and poverty. The mufti organized 30 teams consisting of one man and one woman to investigate the conditions of the women’s sections in all 3,100 mosques in Istanbul. While there was no evidence indicating the intentional exclusion of women, neglect of the women’s facilities at many of the mosques made them uncomfortable and discouraging for female worshippers. After the study, the mufti came up with a plan to make improvements and gave the mosques resources to implement the recommendations. Erdemli’s office is monitoring the results. Some mosques are more difficult to fix because the problem comes from the design — the lack of space allotted to the women’s section, usually in the back of the prayer area on the ground floor or in the balcony. 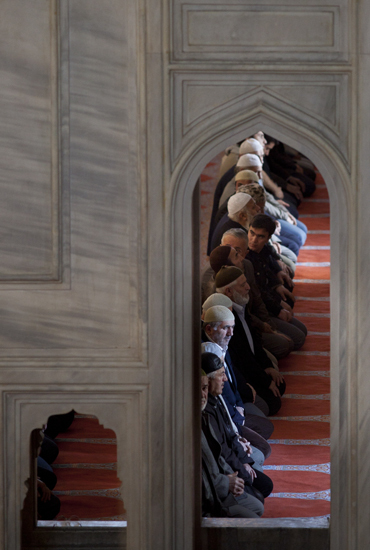 During especially crowded services such as Friday afternoon prayers, the overflow of men often takes over the women’s sections. One of the beneficiaries of the program is the 16th-century Kilic Ali Pasa mosque in the Karakoy port area of central Istanbul. An official plaque says that the government spent 6 million lira (about 2.6 million euro) on its renovation, which includes new women’s facilities. Okumus is clearly a liberal among imams, all of whom are men and many of whom are not very interested in the subject. He said the ideal model of participation in every mosque should be the worship around the Kaaba, the large, cube-shaped structure in Mecca, Saudi Arabia, the center of the Islamic world, where millions of worshippers, men and women, come on the annual Haj. “We should copy it from there and pray together as well,” he said. 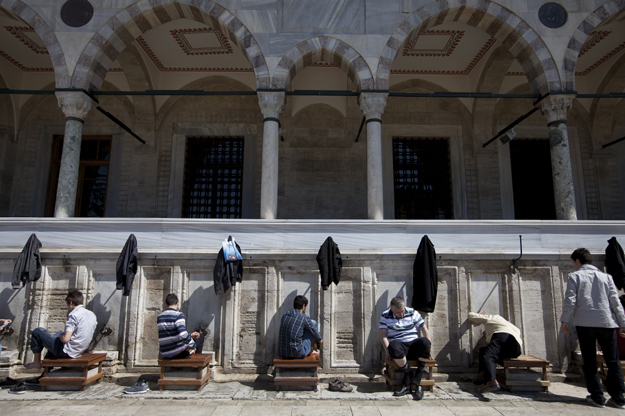 According to a report by the mufti, some 38 percent of Istanbul’s mosques had no women’s toilets and 43 percent had no facilities for ablutions, ritual washing before prayers. The women’s sections were often cramped and overcrowded. Some were used for storage. Erdemli said many were unheated and smelled of mold, with old, dirty carpets. “My mosque was like this, as well,” Okumus admitted. The women’s section was filled with equipment and cables. And the carpet was filthy. Okumus gives me a tour of the renovated women’s facilities and is clearly pleased with the results. There is a special woman’s section downstairs with mesh partitions for the elderly and those unable to walk upstairs. The women’s section upstairs faces the imam and is completely restored with plush, red carpets in 16th-century Ottoman designs, he noted proudly. One of the greatest infrastructural challenges is to equip mosques with washing facilities for women. The ritual washing of hands and feet before prayers is a religious duty for all Muslims. Men usually do their washing in traditional stone fountains in front of the mosque — which poses a problem for women who want to protect their modesty. “No one should see them washing — especially not the men,” Okumus explained, because they have to remove clothing. So, for many women the lack of washing facilities is another reason to pray at home. Although one option is to wash at home before coming to the mosque for prayers. Okumus takes me to the new women’s restroom outside — with two toilet stalls and sinks, as well as special sinks for washing feet. The men have five stalls, a ratio that Okumus said reflects roughly the proportion of worshippers. This mosque has a lot more male worshippers than women because the Karakoy area has workshops and offices of professions mostly done by men. In a city with 3,100 mosques, there is usually one close by. “We follow the community,” he says. Gunay said the increased presence of women in mosques in general is also because they are more informed about Islam. She credits the conservative television channels that dedicate more airtime to religious advice and programs encouraging women to pray in the mosque and visit the tombs of historical religious figures. Leaving the mosque after prayers, Vildana Bilisik, 25, could be a poster girl for Turkey’s up-and-coming Muslim middle-class: a modest young face in a crisp, peach-colored headscarf smiling from an AKP campaign poster. “Praying with the community gives you a special kind of feeling,” said Bilisik, who stopped at Kilic Ali Pasa after her marketing course nearby given by an international cruise ship line. “When you pray alone, you might not able to concentrate so well,” she said. It’s worth the effort to go to the mosque, she said, because it gives her the feeling of belonging to something larger than herself. Studying at the university while working has given her economic independence and the ability to make her own decisions about praying as well as everything else. “In my mother’s time, there was no such thing,” Bilisik said. ABOUT THE AUTHOR Matthew Brunwasser is an independent journalist based in Istanbul specializing in international affairs, human rights and investigative journalism. He has lived in the region for 10 years.